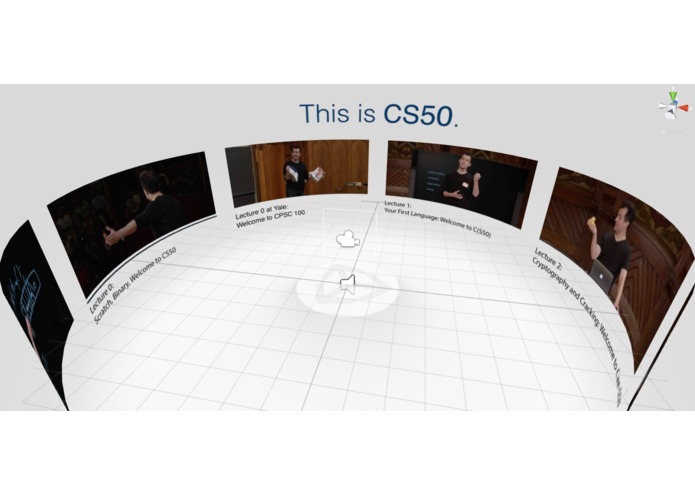 The three of us are on the staff for CS50 at Yale, and thought it'd be neat to create an app for viewing CS50 lectures in virtual reality, providing students with a 360 degree experience, no matter their actual location. The app consists of two scenes: a menu scene and a video player scene. When a student first launches the app, they're brought to the menu scene, where they can look around to select a lecture and tap and hold the touchpad to select. This takes them to the video player scene, where after a few seconds of buffering, the 360 degree lecture will begin. Tapping the touchpad once pauses the video, and tapping it again plays it. Pressing the back button takes the student back to the menu scene.